Washington is losing ground in the South China Sea, and risks making the situation lasting unless America imposes “real” strategic costs to China. Part one of this two-part series provided strategic perspectives and context to the recent uptick in tensions in the South China Sea (SCS) following a year of relative calm since the International Tribunal of the Permanent Court of Arbitration at the Hague handed down its historic and sweeping award on maritime entitlements in the SCS last July. With this backdrop, part two will now examine ways and means the United States can regain the strategic initiative, recover the high ground of regional influence, and stave off losing in the SCS. Embrace Strategic Competition. When two powers, one dominant (United States) and one rising (China), with competing regional strategies extend into one’s another security and economic spheres, the geopolitical landscape is ripe for friction. This competition is not to be feared but to be expected and embraced. Hence, play the Chinese game of “go” and not the Western game of “chess” in the SCS. Continue to reframe the SCS as a strategic problem that directly involves the United States obliges China to act accordingly. Explicitly conveying to Beijing that the SCS is a U.S. national interest, and making the SCS a “bilateral” U.S.-China issue may lead Beijing to rethink and recalibrate its strategy. Put simply, turn the table and make Beijing decide which is more important to its national interests – the SCS or its strategic relationship with Washington. In this vein, the U.S. should stay firm and consistent to stated SCS positions – no additional island-building; no further militarization; no use of force or coercion by any of the claimants to resolve sovereignty disputes or change the status-quo of disputed SCS features; substantive and legally binding Code of Conduct (COC) that would promote a rules-based framework for managing and regulating the behavior of relevant countries in the SCS; and permissibility of military activities in the exclusive economic zone (EEZ) in accordance with United Nations Convention on the Law of the Sea (UNCLOS). Otherwise, deferring to Beijing on aforesaid issues only reinforce the perception in Beijing that Washington can be influenced and maneuvered with little effort. And that’s a game China will win time and time again. Maintain U.S. Attention and Focus. 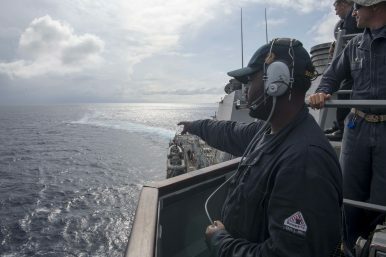 In the coming years, the “most effective counterbalance or check” to China’s campaign of tailored coercion in the SCS will be continued U.S. attention and focus in the form of integrated and calibrated soft and hard deterrent powers (multilateral diplomacy, information dominance, military presence, and economic integration) to reassure allies and partners; demonstrate resolve and commitment; enhance force posture, capabilities, and readiness; bolster economic ties with multilateral and bilateral trade agreements; and dominate the strategic narratives. All in all, if done right, these synchronized and complementary lines of effort will impose the largest strategic costs to Beijing. China most likely will remain the economic partner of choice for the region, while the United States will remain the security partner of choice. As the China-U.S. friction grows and intensifies, balancing these complex and dynamic relationships will become increasingly challenging as regional countries feel greater pressures to choose sides. Thus, Washington should doggedly and preemptively pursue stronger regional security ties and strive to be a more dependable partner – in terms of policy constancy, resolve, and commitment – to strengthen extant alliances and partnerships as well as look for opportunities to build new ones with Hanoi and New Delhi. China is a member of UNCLOS but often violates its provisions, whereas the United States has not ratified UNCLOS but has been its foremost champion on behalf of freedom of navigation, global commerce, and international rule of law. Washington should consider ratifying UNCLOS if its challenges are going to have more gravitas and be taken more seriously. Otherwise, the status quo simply strengthens Beijing’s calling into question Washington’s sincerity to international norms. To compete with Beijing, Washington (and its allies) needs to reframe (and counter when appropriate) the narrative that China dominates with accusations of American containment and hypocrisy and claims of Chinese global benevolence and benign rise. Washington’s message is more-often-than-not reactive and defensive (or sometimes nothing at all), simply seeking to counter Beijing’s strategic messaging. Therefore, the United States should be proactive, seize the messaging initiative, and transition to offense like it did during the recent Shangri La Dialogue; especially, the keynote speech by Australian Prime Minister Malcolm Turnbull, remarks by American Secretary of Defense Jim Mattis during the first plenary session (United States and Asia-Pacific Security), and comments by former Japanese Minister of Defense Inada during the second plenary session (Upholding the Rules-based Regional Order). This message needs to be reiterated at every opportunity. In short, Washington must continue to acknowledge that both countries have competing visions, highlight the flawed thinking of Beijing’s approach, and champion its own approach as the better choice. Do not euphemize, and wherever possible, synchronize the message throughout the whole-of-government and with allies and partners. There can be no U.S. policy seams or diplomatic space for China to exploit. The U.S. should continue the deliberate, calibrated, and quiet campaign of presence operations and freedom of navigation operations (FONOPS), a principle of customary international law, to challenge China’s excessive and contested maritime claims in the SCS. Otherwise, failing to conduct routine operations in the aftermath of the Arbitral Tribunal ruling, particularly FONOPS, would send the wrong strategic signal and further embolden Beijing. Consider eventually expanding FONOPS to other nations and holding “combined (multi-national)” exercises to underscore the universal maritime right of all nations to fly, sail, and operate wherever international law permits. The most promising and enduring counter to China’s developing and evolving maritime strategy is economic integration. Hence, Washington should move forward on bilateral agreements; support the emerging Trans-Pacific Partnership-11 (TPP-11) initiative – original 12 minus the United States – to rework the multilateral trade agreement without Washington; or reconsider bringing back the TPP itself to bind the United States to 11 other regional economies, guarantee an international trading system with higher standards, and complement the other instruments of national power. Otherwise, Washington may inadvertently drive Southeast Asian nations toward other economic alternatives like the China-led Regional Comprehensive Economic Partnership (RCEP), Asian Infrastructure Investment Bank (AIIB), and Belt and Road Initiative (BRI). Underscore the Arbitral Tribunal’s Legitimacy Through Words and Actions. Manila and Washington did not capitalize on last year’s hard-fought legal victory over China’s excessive and contested maritime claims in the SCS. However, it is still not too late to encourage Beijing to act as (or become) a more responsible global stakeholder that contributes positively to the international system. This involves countering China’s public diplomacy point-for-point, and reiterating stated U.S. positions to unambiguously convey American national interests and shape the post-ruling diplomatic space: (1) The United States supports the principle that disputes between countries should be resolved peacefully, without coercion, intimidation, threats, or the use of force, and in a manner consistent with international law. (2) The United States supports the principle of freedom of seas, meaning the rights, freedoms, and uses of the sea and airspace guaranteed to all nations in international law. United States opposes claims that impinge on the rights, freedoms, and lawful uses of the sea that belong to all nations. (3) The United States takes no position on competing claims to sovereignty over disputed land features in the East China Sea (ECS) and SCS. (4) Although the United States takes no position on competing claims to sovereignty over disputed land features in the ECS and SCS, the United States does have a position on how competing claims should be resolved. Territorial disputes should be resolved peacefully, without coercion, intimidation, threats, or the use of force, and in a manner consistent with international law. (5) Claims of territorial waters and EEZ should be consistent with customary international law of the sea and must therefore, among other things, derive from land features. Claims in the SCS that are not derived from land features are fundamentally flawed. (6) Parties should avoid taking provocative or unilateral actions that disrupt the status quo or jeopardize peace and security. The United States does not believe that large-scale land reclamation with the intent to militarize outposts on disputed land features is consistent with the region’s desire for peace and stability. (7) The United States, like most other countries, believes that coastal states under UNCLOS have the right to regulate economic activities in their EEZ, but do not have the right to regulate foreign military activities in their EEZ. (8) U.S. military surveillance flights in international airspace above another country’s EEZ are lawful under international law, and the United States plans to continue conducting these flights as it has in the past. The upcoming Asia-Pacific Economic Cooperation (APEC) Leaders Meeting, U.S.-ASEAN Summit, and East Asia Summit (EAS) in Vietnam and the Philippines respectively offer a strategic opportunity for U.S. President Donald Trump to advocate for implementation of the 2016 arbitration decision, call for a substantive and legally binding COC, restate U.S. national interests in the SCS, and reinforce U.S. commitment to its regional allies and partners. Such open and public policy statements will have a significant influence in shaping China and the region. Washington should encourage and support Hanoi, Kuala Lumpur, Bandar Seri Begawan, and as much as possible the other ASEAN countries, in putting additional pressure (including via legal challenges) on Beijing to curb its assertiveness, stop its land reclamation and militarization activities, and come in good faith to the multilateral negotiating table for a peaceful and enduring resolution of the competing and contested maritime claims. The window of opportunity to regain the strategic initiative, recover the high ground of regional influence, and stave off losing in the SCS may soon close for Washington. To Beijing, continued U.S. passivity and acquiescence imply tacit acknowledgement and consent to execute its strategic ambitions and strategies unhindered and unchallenged. For decline is a deliberate choice, not an imposed reality. Despite some setbacks, the United States has not lost influence in the vital waterway.